When it comes to gaming, many gamers are on the lookout for the best possible hardware that will be able to suit their current configuration. Of course, there are many different kinds of makes and models out there, and depending on the type of game as well as gamer whom you are, in addition to the genre that you would like to get involved in. 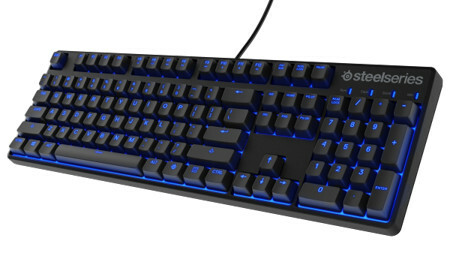 SteelSeries, a name that has long been revered as one of the better gaming hardware manufacturers out there, has just revealed their SteelSeries Apex M500 mechanical keyboard. In a nutshell, you can call this a battle-ready mechanical keyboard that will target performance purists who will then be duly armed with Cherry MX and SteelSeries Engine software. Being tournament-ready at all times, this mechanical keyboard will come outfitted with Cherry MX Red gaming switches as well as SteelSeries Engine customization software. The asking price for such a high performance piece of gaming hardware would be $99.99 a pop, where it will boast of a traditional key layout for universality, Anti-Ghosting technology and blue LED backlighting. SteelSeries’ acclaimed software that comes with each purchase will be able to deliver the ultimate level of individual customization for gamers. Both pros and enthusiasts are able to program individual keys for unique combinations, create advanced macros for faster gaming commands, launch game profiles automatically, and create unlimited profiles to unlock infinite gaming possibilities. Throw in a smart cable management system with a trio of cable guides that will adapt to your keyboard setup to eliminate tangles and interference, and you’re good to go. It will also be armed with 100% Anti-Ghosting technology with 104 key rollover to ensure precision no matter how fast you play. Definitely you will no be able to press the buttons on this keyboard faster than it can register the movements, which is a good thing for sure.